Each week, Poor Scholars digs a little bit deeper into the catalog of an infamous “one-hit wonder” by listening to their other “top hits” on Spotify to explore what exactly went wrong. This week, Poor Scholars’ Scott Phillips breaks down the other songs of Freak Nasty. Completely stunned; I proceeded down Southport. 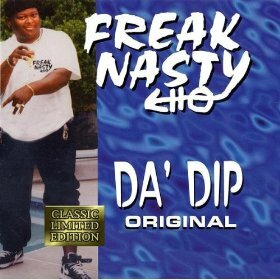 As a track, “Da’ Dip” reached No. 15 on the Billboard Hot 100 and eventually went platinum. It’s a decent enough 90s rap dance track that’s cheesy, catchy, and oversexed. “Smurf Rock” – I couldn’t find this song on YouTube, but it’s an instrumental that sounds like it may sample voices and sounds from Afrika Bambaataa’s “Planet Rock“, which is a superior song. Listen to that instead. “Down Low” – This song blatently rips off 69 Boyz’ jam, “Tootsee Roll” and also name drops “Da’ Dip.” You’re not missing much here. The video — which looks like it was filmed on a $70 budget — features a bevy of afternoon-shift exotic dancers, some kind of club and a much older and heavier Freak Nasty wearing a backwards Aaron Brooks jersey. It’s everything I want from a rap video I would see on my local Public Access channel. Freak Nasty may not make innovative tracks, but the man has been making party videos for 10 years and doesn’t appear to be stopping any time soon. Good for him. America.